Best SUP Boards 2017- The Top 5 Ulitmate Picks Reviewed! The best stand up paddle boards offer a great workout and are a ton of fun to ride. Anyone can learn how to ride a paddleboard because they’re so easy to use. However, choosing your first board can be a real challenge. Choosing one that’s right for you will all boil down to your lifestyle, what you plan to use it for, and the type of budget you have to work with. If you aren’t a hundred percent sure of what you’ll be using it for, we can help you figure this out in as little as twenty minutes. We’ve designed a buying guide that will make it much easier for you to choose the best SUP based on your interests and fitness goals. In order to find the right board, it’s important to know the main differences between each type, so we’ll do a quick rundown of the most popular styles of SUPs to give you a better idea of what’s out there. First is the all-around SUP. This style is perfect for beginners and is very versatile. It’s able to handle all types of water conditions and it’s probably the most common SUP design. The surf SUP is a good choice for intermediate and advanced paddlers because they are less stable on the water, requiring a rider with some experience. These are very maneuverable and highly shreddable. A touring SUP is the main choice for the serious paddler with an interest in a high-intensity workout. These are designed for long distance paddling on flat water, lakes, bays, and the open ocean. They are constructed for max efficiency and glide. They’re also typically stable and wide enough for beginners. Racing SUPs are designed for down winders, flat water races, or even open ocean competitions. The extra width and length generate a longer glide efficiency and a faster sprint speed. However, they can be very challenging for beginners because they don’t have a reputation for stability. The fishing SUP is a good choice for anglers who don’t want to invest in a kayak or boat. These offer the most volume, allowing the rider to stay high and dry and out of the water. They often come equipped with pre-installed Scotty mounts which allow the rider to personalize their fishing experience, giving them the option to add fish finders, rod holders and other gear needed for a longer trip. 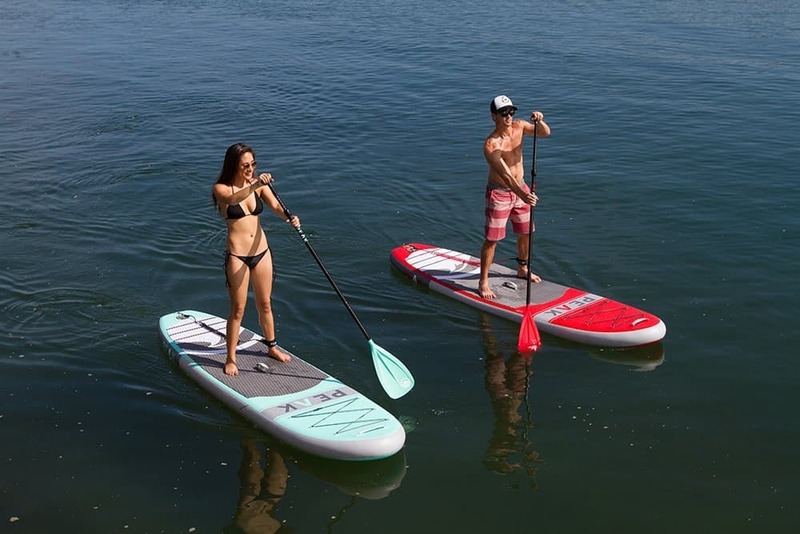 The yoga SUP is designed for yoga or any other fitness routine, including flat water paddling. These are designed with stability in mind and their expansive deck pads offer ample room for yoga moves. We’ve reviewed some of the top models on the market, so you’re bound to find just the board you’ve been looking for. Each of these has something special to offer, whether it’s the highest rated model or one we feel offers the best bang for your buck. These five top selling boards scored well with consumers of all skill levels and are rated in terms of overall quality, pricing, and standout features. Peak : The Perfect package for beginners on a budget, you’ll love how the Peak handles in the water, however, if you’re looking for a board with some serious speed then you may want to pass this model by. 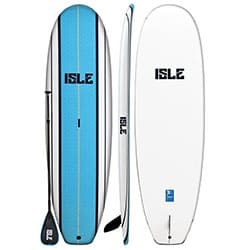 Isle: This is a soft top SUP that features a wood, plastic, and foam design that can handle milder water conditions like a champ, but it may not be the best option for longer outings on the water or rougher surf. Bestaway: Featuring a narrow, sleek design, this is easy to maneuver and comfortable to ride. Unfortunately, the lower weight capacity makes this model only suitable for lighter riders. Solstice: Great for beginner and intermediate boarders, this is one versatile model that can handle up to two riders, just as long as you stay below the recommend weight limit. 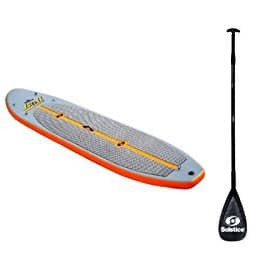 Built tough and designed with a soft, innovative non-slip surface, this board is truly a pleasure to ride, workout on, or just enjoy a leisurely day out on the water. Bic Sport: This longer SUP features a innovative, wide design that allows new boarders to learn how to balance and paddle at their own pace. The perfect learning tool, this is slower than average which is what makes it such a great choice for beginners. These days, there are several models of inflatable SUP bundles on the market. This package by Peak features a mid-sized board that measures in at ten feet, six inches long, with a weight capacity of three hundred pounds. But despite the high weight capacity, this is surprisingly light, weighing only twenty-three pounds. This package also comes with a carry backpack, paddle, high-pressure pump, and coil leash. Ultra-durable, which features military grade PVC and comes with a one-year product warranty on materials and a thirty-day guarantee. The board’s max inflation level comes in at fifteen PSI, but it’s plenty rigid and fully functional at just ten PSI. It’s extra thick design does wonders when it comes to keeping the rider above the water. This SUP delivers above average performance, regardless of water conditions. It’s stable enough for even beginners and comes equipped with a ton of features that will aid the rider, such as a center carry handle, nose mounted handle, bungee storage system, non-slip traction deck pad, and a D-ring system for extra storage. Users will also love the three piece adjustable floating paddle, tool-less removable fin, and the air pump complete with an integrated pressure gauge. The durable PVC material used can’t become damaged or dinged like a normal hard board can. The non-slip deck features a diamond groove design for improved traction. The removable center fin helps to improve tracking in certain water conditions. It also pops right off or slides easily into place so you won’t need to bring any tools if you need to remove it. The bungee system is placed at the front of the board and can be used to tie down a ton of gear. The board’s stable, rigid shape is suitable for riders of all skill levels, not to mention a variety of water conditions. While not the worst, we felt that the hand pump is a poor choice for inflating a SUP. So, do yourself a favor and buy a good electric model in order to save time and inflate this board more efficiently. The aluminum paddle isn’t anything to brag about. We recommend using a quality carbon fiber paddle instead. This isn’t the fastest choice on the market, so if you’re searching for something quick, you may want to look elsewhere. This board is perfect for riders who are searching for a multi-use model. The PEAK is able to hold its own on a variety of fronts and makes a good primary board for the beginner and the pro. This model’s stats definitely rival hard boards, but the ease of transport and it’s weight are superior. This can easily fit in a trunk and the handy carry bag allows users to tote it around on the beach or on a hike, with ease. 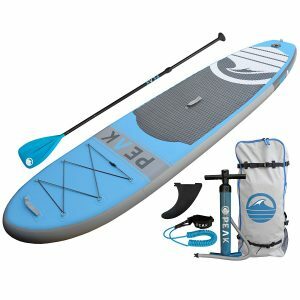 The Peak comes with everything you’ll need to get started paddling, and it’s priced much less than what you can expect to pay for a hard model. The Isle classic soft top is a great choice for riders of all skill levels. The board’s durability allows it to support users up to three hundred pounds, which is pretty remarkable for such a lightweight board. While this is lightweight, it’s still able to remain stable and rigid in the surf. The wooden design allows you to ride in style and also offers a smoother ride on flat water. This Isle package comes with a fin, center handle, and an adjustable paddle. One of the board’s best features is its flexibility, making it a good choice for both the beginner and the pro. Even a novice rider can glide through flat water easily. Another popular feature is its non-slip surface. Isle holds a patent for their efficient, water-resistant soft top skin, which is what makes riding safer, especially for the novice. This also comes with an embedded triple stringer. The triple stringer gives the board the type of rigidity and stability that every rider looks for. Measuring in at just thirty-one inches wide, with a weight of twenty-seven pounds, this is easily manageable for short jaunts to the river or beach. This board is designed to match the performance of a traditional epoxy surfboard. The soft top is made with built-in grips that improve hold and provide more rigidity. Its hard bottom is made from a tough plastic that allows for a smoother ride both in small surf and flat water. The materials used in this model’s design provide protection and comfort for the rider and all without compromising the integrity of the ride. The board’s wooden design never fails to impress consumers. It may appear fragile, but the finish protects it from scratches, scrapes, and cracks. The included sturdy alloy paddle is highly adjustable. 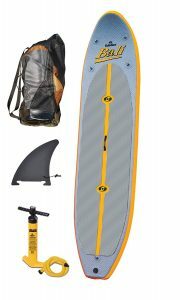 This bundle comes complete with a center box fin, easy lift carry handle, and surf leash. While it is a great board for beginners, the quality of the material leaves much to be desired. The hybrid foam, wood, and plastic design are not very durable if you’re looking for something that can take a beating. Overall, it doesn’t offer the same type of toughness you’d normally get from a hard board. Not quite the same design and toughness that you’d normally expect from a hard board, but this model does offer impressive rigidity and quality for the price. Many riders even found that they preferred the soft top design over the traditional hard top. You may notice that the top material tends to dent easily if you strap the board to the roof of your vehicle. But overall, the small imperfections in the design still make this well worth the purchase. It is comfortable to ride, and the non-slip surface works well in a variety of water conditions. Ultimately, this is a great buy for the rider on a budget. 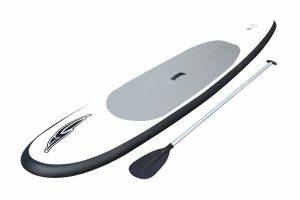 The Hydro-Force SUP by Bestway features a couple of modeled side fins, a removable middle fin designed for directional stability, and an anti-slip traction pad. This also comes with an aluminum paddle, inflation pump, travel bag, and pressure gauge. Users will also love the multiple D-rings found on the nose, which allows the rider to attach gear securely. 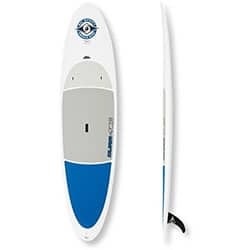 The board measures in at ten feet, two inches in length, and twenty-seven inches wide, which is a bit narrow compared to most inflatable SUPs in this price range. Since inflatable SUPs have a reputation for flexing in the center, under heavy weight, we wish that this was thicker than four inches. This model offers a basic, sleek design and is built with an all-around shape that’s perfect for touring. The anti-slip traction pad covers more than 2/3 of the board and it’s very functional and soft, making it comfortable to stand or kneel on. The central carry handle allows you to easily transport it once it’s fully inflated. The included bungee system consists of four D-rings that are connected with a bungee cord. These D-rings will definitely come in handy when you need to bring along some gear. You’ll also find a fifth D-ring located on the tail. This is typically used to attach a safety leash. The board’s Tri-fin navigation system offers improved performance in a wide variety of water conditions. The central large fin is removable, while the other two fins are fixed, lateral, and much smaller. Other features include a compact hand pump that can inflate it up to 15 PSI, rather quickly. The included three piece adjustable aluminum paddle is designed to suit the paddler’s height. The carry pack makes it easy to lug it around on long trips and does a good job of protecting the integrity when you’re on the move. The board itself performs relatively well in a variety of water conditions. Riders have reported that it’s incredibly easy to change directions on this SUP. When it comes to its stability, it’s very easy to balance your body on top of the board, despite the fact that it’s pretty narrow. Overall, it offers plenty of value for the price. The fact that the board is only four inches thick makes it prone to bending at the center when ridden by heavier users. Also, there were some complaints regarding its narrow design. Some riders also felt that the included paddle was too heavy and not of the highest quality. With a max weight capacity of just two hundred and twenty pounds, this isn’t meant for heavier riders. Failing to stay within the recommended weight means you’re sure to sink out on the water. The weight capacity is probably the biggest limitation we found with this model. However, lighter riders will benefit from a board that’s well-built, easy to maneuver, and priced affordably. The Bali stand up paddleboard by Solstice is a great choice if you’re searching for a basic SUP package. This is a high-pressure inflatable model that’s pretty fast and lightweight. This has been described as strong and rigid and it comes with everything you’ll need to get started out on the water including a gauge, pump, and carry bag. It performs well in all types of water conditions and it’s perfect for one or two people use. As you’ve probably already guessed, this has a lot to offer. It’s a good choice for beginners and intermediate boarders. If you’re looking for a model with plenty of storage space, look no further. You’ll find a total of four stainless tie-downs that will allow you to expertly secure your gear. As we have mentioned, this is one tough board. It’s made from a durable five hundred denier three-ply PVC reinforced material. The board measures in at ten feet, eight inches long. You can enjoy improving your balance and building your stamina while having fun at this same time riding it and slicing through the water. This is a high-performance model that features a tri-fin design for expert tracking and outstanding performance. Its unique multi-layer construction works to reduce any flex, allowing it to easily handle a large amount of force. The traction top is made from Non-slip EVA materials, providing maximum comfort and grip while you’re riding the surf. The core is made from drop-stitched, high-pressure material. It has a decent weight capacity of two hundred and fifty pounds, although many models in this price range have an average weight capacity of three hundred pounds. The durable PVC material enables it to easily handle extreme conditions. It also includes a rear D-ring, designed for optional leash attachment. The included hand pump is decent quality. It works to inflate it in just a few minutes, up to 15 PSI. The included carry bag is too small to hold the board when the fins are installed. Most riders have found that a strap with a plastic clip tends to work better for carrying it when it’s deflated. For the price, some buyers were disappointed that this package doesn’t include a paddle. Another issue is the thickness, which is only four inches. However, if riders follow the weight capacity recommendations, there should be no issue with it flexing. Really, for a board that can expertly handle a wide variety of water conditions, you can’t beat the price. Its large, soft surface will easily accommodate two riders, or one rider and plenty of gear. Perfect for touring, riding the surf, or just paddling over flat water, this Solstice SUP is very versatile, well-built, and designed for speed. The Bic Sport Dura-Tec SUP offers the classic longboard shape, providing a more balanced, stable board that’s easier to ride. Its polyethylene construction is built with durability and strength in mind. This also features an integrated deck pad designed for comfort. You’ll also love the ten-inch dolphin fin, deck rigging anchors, and the integrated leash plug. This model measures in at an impressive eleven feet, four inches, making it the longest SUP we reviewed. This SUP is designed as an all-purpose board that’s perfect for beginners. It can easily handle light surf and flat water conditions, although it’s not known for its speed. The high-density foam core is encased in a thermoformed polyethylene. This type of layered construction provides the board with a durable inner core and shell, while still allowing users to enjoy a lightweight model that’s easy to transport. This is designed to withstand a wide range of water conditions, including rough waters. It can handle bumps, knocks, and rough use that comes with repeated use by the avid boarder. The fact that it is so durable is one of the main reasons you’re likely to find this model in SUP rental shops and schools all over the country. The board’s tough shell is designed to provide optimal protection compared to fiberglass boards. While we focused our review on the eleven-foot model, it is also available in nine and ten-foot options. When it comes to the size you should choose, this is often dependent on the weight of the rider. The nine-foot model is recommended for riders up to a hundred and thirty pounds. The ten-foot is wider so it’s able to handle heavier riders up to two hundred pounds, while this model, the eleven foot SUP can handle riders up to two hundred and ten pounds. The variety of sizes will allow you to choose the perfect board for each member of the family, at a price that’s reasonable. We recommend this board for beginners simply because it isn’t very fast, which, in turn, will make it easy for beginners to learn how to balance on and paddle. We came across some complaints regarding the roughness of its surface. Some riders recommend wearing knee pads in order to prevent bruises or burns caused by friction. The manufacturer rounds out the board’s features with design elements that are focused on ease of use and comfort. This model includes a unique deck pad that comes equipped with soft diamond grooves for added traction and control. This model also includes a custom carry handle for easier transport. Overall, this is a stable, fun board to use and a model that can be enjoyed by the whole family. When it comes to its durability, this SUP truly shines. However, if you’re looking for a model with some speed, you may want to pass this by. A SUP board offers something for everyone. Users can catch some waves in the ocean or even head out for a relaxing paddle out on a calm lake or large pond. 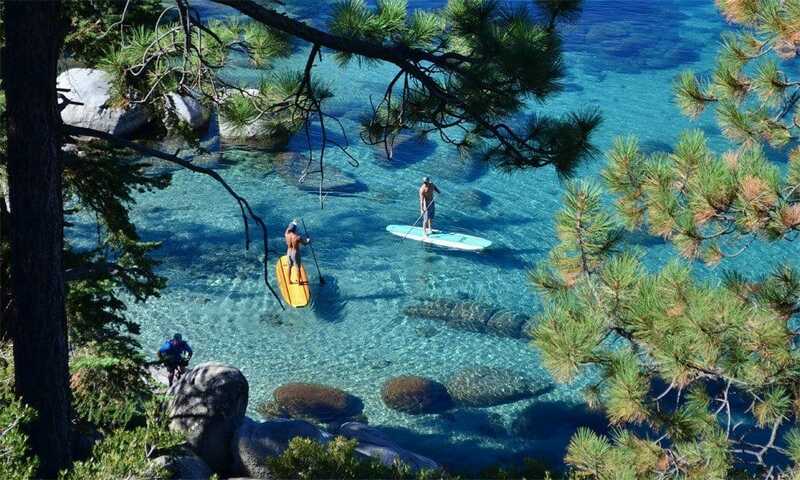 Fitness enthusiasts have even turned to SUP yoga workouts or even faster paced paddling for a high-intensity workout. Whatever your fitness goals may be, finding the right board will be the key. In order to find the right stand up paddleboard, you’ll need to consider a number of factors. First up is choosing the hull type. There are a couple of main choices: displacement hull and planing hull. The type of hull you choose should be based on the type of paddling you plan to do. Next, should you go for a solid board or an inflatable board? The construction can affect the board’s weight, storage options, portability, price, and performance. Pro Tip: You should choose somethig with a weight capacity and volume that’s a good fit for your weight and height in order to ensure optimum stability. The different styles of boarding can require different lengths. The length of the board will also have a big impact on maneuverability and stability, and how easy it will be to store in the home. The board’s width will primarily affect the overall stability, however, the thickness can also play an important role. The fins can increase stability and tracking abilities. Some SUPs include pretty cool extras including tie-down points and bungee straps for stowing gear. After you buy a board, there are certain accessories you may need such as a leash, PFD, or paddle. The body, or hull, of a SUP, will play a major role when it comes to determining how it performs in the water. As we have mentioned, most models feature either a displacement hull or a planing hull. Most boarders usually select a hull based on how they plan on using it. The planing hull is wide and flat and it features a design that’s similar to a surfboard. This style is designed to ride on top of the water and it has a reputation for maneuverability. 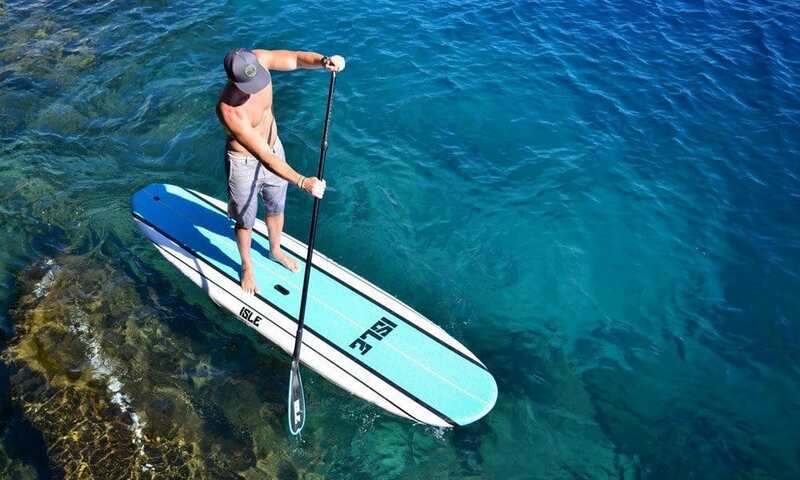 A board with a planing hull is also very versatile, which makes them a great choice for SUP yoga, surfing, recreational paddling, fishing, and down winding. A board with a displacement hull features a pointed bow or nose that’s similar to that of a canoe or kayak. This style of a hull is able to easily slice through the water, pushing it around the board’s nose to the side of the board in order to create a smooth, fast ride, while also improving its overall efficiency. This style of board requires less effort to paddle compared to planing hull models. This enables the user to go at a faster speed for a longer distance. These boards are also sturdy but are usually less maneuverable than models with a planing hull. Board users should choose this style if they’re interested in SUP camping or touring, or if they enjoy recreational paddling, touring paddling, or fitness paddling. The inflatable paddleboard features an exterior made of PVC with a drop-stitch construction that creates an air core. These come with a pump to inflate it and a handy carry bag to store and protect the board when not in use. 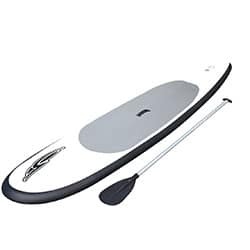 While an inflatable SUP is easier to transport and store, they usually ride much higher in the water and offer more flex than a standard solid board. This will give some boards a less than stable feel. So, who would benefit from using an inflatable board? If you live in an apartment or a house and you’re short on space, then you probably won’t have the room to store a solid board. Inflatable models are very compact once they’re deflated, so they can easily be stored in small spaces such as the trunk of a car or in a closet, or even checked on a plane. Many carry bags also come equipped with a couple of straps so they can be worn as a backpack. If you’re on a hiking trip and you want to use your board once you hit a large body of water such as a pond or lake, you certainly wouldn’t be able to bring a solid board along. Inflatable models can still be heavy to carry for long distances, but they’re still a great option if you want to mesh your love for hiking in the great outdoors with paddling on a calm lake. Like an inflatable kayak or raft, an inflatable board is designed to handle bumps against logs and rocks much better than a solid board. If you love mixing boarding with yoga you might prefer using an inflatable model because they’re often softer than solid boards, which, in turn, can make them more comfortable to use for yoga poses. The solid stand up paddle board is the original. These models are often made with a foam core that’s surrounded by several layers of fiberglass. 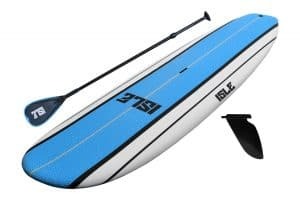 This style is usually regarded as being a lot more rigid than an inflatable board, which can make them feel more stable when paddling heavier people or riding over choppy waters. Most models of solid SUPs feature an EPS core that’s wrapped with epoxy and fiberglass. Plastic and carbon fiber are also used for some board exteriors. If stability is at the top of your list, a solid board offers more rigidity when compared to inflatables, giving them more stability when riding waves. A solid board also rides lower in the water, which can also make the user feel more stable. It also tends to have a little less drag than an inflatable board, which means they tend to be more efficient when paddling over long distances, not to mention much faster. However, this style can also take up quite a bit of space. If you have ample storage in your home and a vehicle big enough to transport it, then a solid model is a great choice. You need a board that will work for your size. If it doesn’t correctly displace the right amount of water for your height, then you won’t be well supported and the board itself will feel very unstable. Weight capacity and board volume are both important factors that can affect how stable you’ll feel during a ride. The board’s volume, which is often expressed in liters, offers an indication of its ability to float with weight added. The higher the volume, the more weight it’s able to support. The SUP volume should be listed on each model’s spec sheet. Pro Tip: A short board can offer a higher volume if it is thick and wide. Similarly, a long board can have a lower volume if it is thin and narrow. This means that a person who weighs around two hundred pounds will want to look for a maneuverable short board with a higher volume. Every SUP model will feature a rider weight capacity which is listed in pounds on the board’s spec sheet. Knowing the weight capacity can be important because if a rider is too heavy for a board it will make the rider sit too low in the water, making it difficult to paddle. A rider can’t be too light for a SUP, so as long as their weight is less than the board’s weight capacity they should be good to go. Paddling fast on a calm lake or riding the waves in the ocean involve very different styles of SUPs with different lengths. Generally, a longer board will be much faster than a shorter board. However, the shorter board will offer better maneuverability. It can be helpful to understand how the board’s length relates to the weight capacity and volume. Longer boards will increase the capacity and volume, making them feel more stable. You should also consider a board’s length in regards to the type of vehicle you drive, the length of the walk to the shore or beach and your home storage situation. A longer board can be more difficult to tote around, especially when it’s windy. A short board is considered a SUP that’s less than nine feet in length. These boards are perfect for kids or surfing. They’re more maneuverable than long boards, which is what makes them great for catching waves. Models that are specifically designed for children are usually around eight feet in length. A medium length SUP measures in at around nine to twelve feet in length and they’re perfect for use in the surf and on calm lakes. A long board will measure in at twelve and a half to fourteen feet in length and they’re ideal for long distance touring or faster paddling. These boards are often much faster than medium or short boards and they usually track straighter. If you’re interested in touring long distances or paddling faster, then you should consider a long SUP. These boards will also provide the rider with more room to store their gear, which is essential for riders who enjoy touring. The SUP board width is also an important factor when it comes to determining its stability. Models that are around thirty-six inches wide can accommodate a wide variety of body types. Boards that are thirty-one inches or wider are classified as wide boards, which have a reputation for being more stable than the average narrow board. This can make it easier to stand while paddling, however, a wide board is much slower than a narrow board. A narrow board will measure in at twenty-nine to thirty inches wide and they’re much faster than a wide board. However, they’re also known to be less stable. How thick a stand-up paddleboard is can also affect the board’s stability. Generally, a thicker model will offer more stability, but they also tend to not be as responsive as a thinner model. If you’re a beginner, you may want to go with a thicker SUP. One fin: Many models feature just one fin that’s placed in a fin box, secured with a screw and nut. The fin box features a channel for the fin, allowing it to slide back and forth. The fin provides minimal drag and good tracking, which makes it a good choice for flat water riding. Three Fins: A three fin setup is also referred to as a thruster. This setup improves tracking on flat water and offers better control in the surf. Each of the fins is the same size. Two plus one: This setup includes a small fin placed on each side of a larger center fin. This is an ideal setup for surfing. Racing fins: These fins tend to be stiffer and straighter than other fins and they’re perfect for downwind runs because they can help a board to track easier in rolling swells and large wind waves. Fins for inflatable boards: Inflatable models can come equipped with any of the fin setups listed above. But what sets them apart is that they feature detachable semi-rigid fins that can be removed or flexible rubber fins that are attached to the board. Best SUP Boards - Reviewed & Compared Honestly	Overall rating:	5	out of 5 based on 5	reviews.